Alabama School Panic: Is ‘Clown Lockdown’ the New Normal? Over the past month schools throughout Alabama have been threatened by several people claiming to be clowns. Responses to the threats—many of them originating (or shared) on social media—have resulted in increased police patrols and in some cases full lockdowns. Police in Flomaton Ala. investigated what were deemed credible threats to students at Flomaton High School that were shared via social media. A total of about 700 students at Flomaton High School and nearby Flomaton Elementary School were told to shelter in place while the schools, following protocol, were placed on lockdown for much of the day while dozens of police and other law enforcement officers searched the grounds for threats. The threats had originated from two Facebook accounts, "FLOMO KLOWN" and "Shoota Cllown"; the digital trail led FBI investigators to one adult and two teens. Twenty-two year old Makayla Smith of Flomaton was arrested for making a terroristic threat while posting as an evil clown and is being held on a $200,000 bond. This string of incidents may leave parents and teachers wondering if the "clown lockdown" is the new normal, and indeed a similar incident happened again in Irondale, another Alabama town. As the news website AL.com reported, "Irondale police Officer James Lewis, a school resource officer, said a student reported to police that a Facebook post hinted at the possibility of clowns showing up on campus at Shades Valley High School. Irondale police Det. Sgt. Michael Mangina said they have two school resource officers assigned to Shades Valley. In addition to those two officers, extra officers were patrolling the campus today. Mangina said they are monitoring the situation, but said they are not overly concerned. 'Part of the problem is the fact this stuff gets on social media and it explodes and it alarms people and it just spreads,'' he said. 'In today's climate, we're better safe than sorry.'" In a third Alabama school threat that week, two people dressed as clowns appeared in a Facebook video brandished a knife and ranted for several minutes about "coming for you in Troy, Alabama." Police identified the two in the video, which had been seen more than 50,000 times, as juveniles who attend Charles Henderson High School in Troy. Police did not charge the two boys because the video did not contain a specific threat to a person, building, or institution, but warned in a public statement that other potential copycats that such pranks would not be tolerated: "The Troy Police Department strongly discourages anyone from dressing as a clown or wearing a clown mask for any reason due to the sensitive and threatening environment that this type of costume is currently under." Not only have creepy clowns recently been reported in Greenville, S.C., allegedly luring children into the woods. No evidence of those clowns has emerged and they are widely considered merely rumors, but there have been a handful of people dressing as clowns and scaring people. Last month a pair of Canadian teenagers dressed as clowns were having fun in a park scaring younger kids, and in Wisconsin a clown seen at night was revealed to be part of a viral marketing campaign for a scary film. 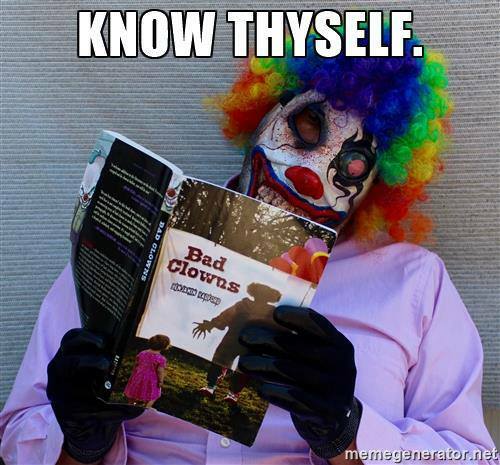 In some cases both adults and schoolchildren have admitted to making up stories of seeing threatening clowns. Any other time reports of threatening clowns would likely have been ignored or dismissed, but these copycat clown incidents come at a time when very real terroristic threats and school shootings are in the news. Parents can take comfort that no clowns are actually trying to abduct or harm kids—not a single credible report has surfaced of any child being hurt or even touched by a threatening clown in recent weeks. Still, teachers and police understandably err on the side of caution, deciding it's better to be safe than sorry. Social media plays a large role in inspiring these copycat incidents and police, who waste time and resources responding to these false reports, hope that the novelty of reporting fake clown threats wears off soon. Talk Tonight: “Contacting the Dead: Séances From the Victorian Era To Modern Times” I’m quoted in ‘The Guardian’ on scary clowns!